Are you tired of having your car filled with toys that are scattered everywhere? We understand our children love to bring their toys along for car rides. After all, they need to keep themselves busy while you drive! However, when the books, toys and play things start to pile up, things can get out of control pretty quickly. 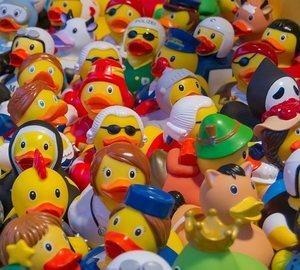 Is an army of toys taking over your car? Whether you use your car for road trips, day-to-day activities, work, or as the carpool bus, it’s important to keep it organized and free of clutter. It’s great to keep your kids busy while you drive, but too many toys thrown around the car can be dangerous and be a potential obstacle or distraction that cause a collision. There is an easy solution to keep your car organized and your kids happy and occupied: a kids car seat organizer. If you are in the market for additional car seat storage for your children, we know what you need down to a science. You’ll want to find storage that offers multiple compartments, sturdy material, and offers extra storage and versatility. 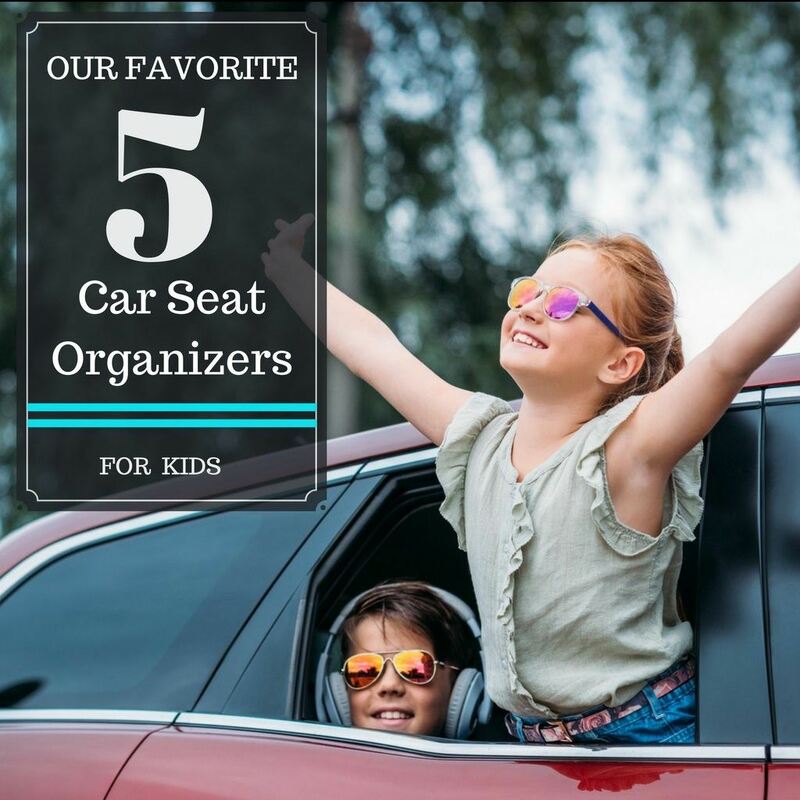 We have already done the hard work for you and found the best five car organizer for kids. Enjoy our list! 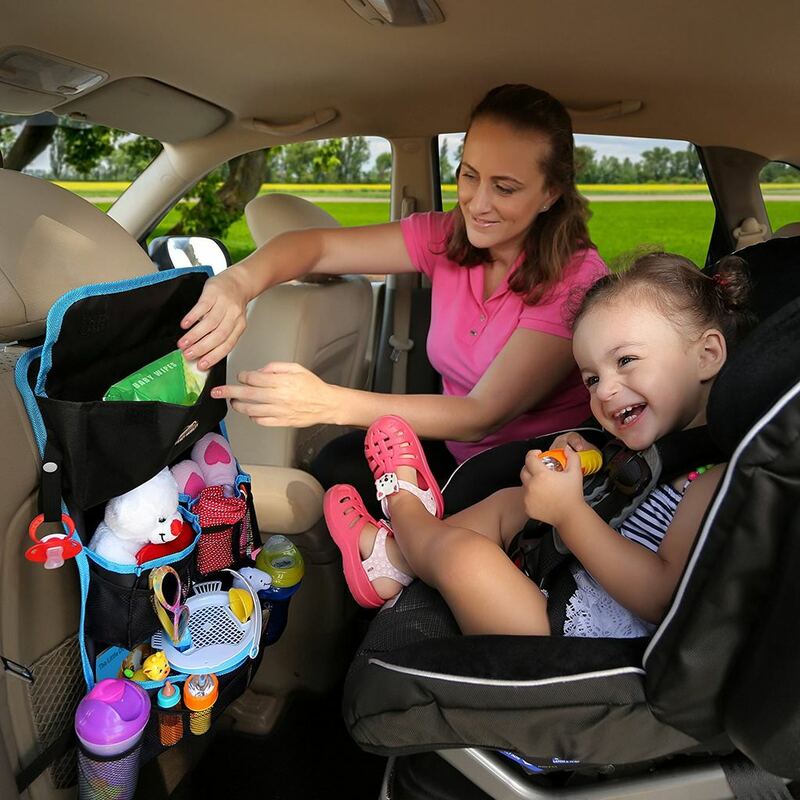 Designed for complete versatility, this is the ultimate backseat car organizer for everyone with active children. The Fancy Mobility Organizer is also the only one on Amazon that offers an extra car visor organizer as a bonus to your purchase. So this is a good pick for both you and the kiddos. Created with quality and durable waterproof material, this organizer will not break or tear. The easily adjustable top and bottom straps are designed to make it a good fit for just about any car. The organizer stays tight to the seat, containing all the toys securely so they will never end up on the floor of your vehicle. There are deep storage pockets with an elastic lining that are easy to clean. Perfect for all your storage needs, the Fancy Mobility Organizer is offered at an affordable price at just under $10. The Mack-daddy of all car seat organizers is the Lusso Gear Organizer. We especially like the fact that it has a whopping 8 storage compartments for toys, tissues, books, magazines, games, and more! This organizer offers more compartments, which means more storage space. 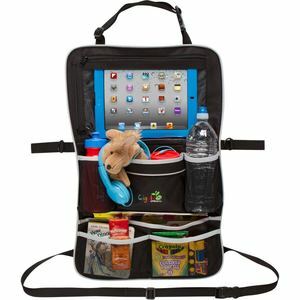 The 8 different compartments include 2 large main areas, 1 zipper pocket, and 4 built-in cup holders for kid cups or bottles. The Lusso Gear Organizer has two sturdy handles so your child can carry it by themselves. This organizer should provide for more than enough storage during your trip. 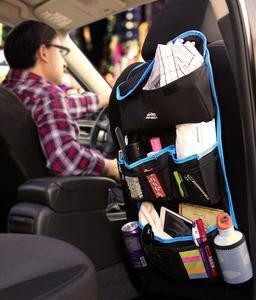 Good for adults or children, you can use this organizer in your car for almost anything. Although it offers many compartments, some customers say it was a bit smaller in size than they expected. It is a bit narrower than some of the other organizers on our list at just 9-1/2 inches wide. A popular organizer on the market today is the Carchet organizer with a built-in tablet holder. Since many of today’s children are more interested in touchscreen than a coloring book, this is a good choice. The tablet holder fits screens that are 10.1 inches or above and is located behind a clear plastic film which helps to protect it from messy fingers. Not only does this organizer offer a tablet holder, but it also serves as a seat protector and kick mat for kids. At about 13 x 9 inches, it is large enough to cover the whole back seat. Offering multiple pockets and sturdy material, this organizer is one of the best choices, especially for slightly older kids. The price point is a win as well at just under $15. If you have older children or constantly driving the carpool, the High Road Kids Car Seat Cooler and Organizer is a great choice. 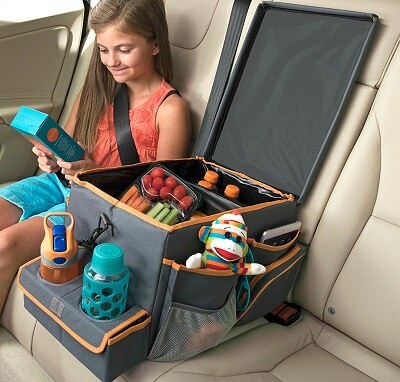 Offering car organization, insulation food compartments and a lid to serve as a food or play tray, the High Road Kids cooler and organizer is extremely durable and portable. What we really liked about this organizer was the convertible flip-top lid. The sides can be turned up to create a built in tray perfect for playing cards or having a snack. This helps to keep smaller items from falling off the tray while you are driving. Fewer toys and more food or larger objects. If you need a smaller toy organizer, the Giggle Sprouts Universal Organizer is perfect for the job. It keeps the backseat clear of clutter successfully and also offers a tablet holder like the Carchet brand. The exact measurements are 23 x 15 x 1 inches. There are eight separate pockets including two drink holders.The tablet holder is behind a clear film that still offers touchscreen access for small fingers. Made from a water-resistent fabric, the organizer was design to protect both your seat and your child’s items. The price point at the time of this article was between $15 and $20. Keeping the car organized will keep the whole family happy. 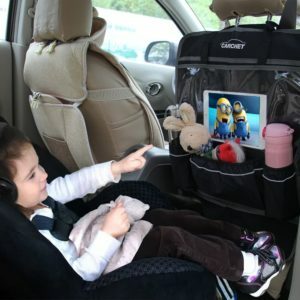 Everyone who cares about their little ones and keeping an organized and clean car needs a car seat organizer for kids! Not only do the organizers keep the toys from being scattered around the car, but they give your child a place to keep their favorite activities. A kids car storage organizer is an easy and affordable solution for everyone. Of all the items reviewed here, the top contender is the Fancy Mobility Organizer. Not only does it have multiple compartments, but it even includes an additional organizer for mom or dad. It is durable and versatile, fitting perfectly in just about any type of car. To organize your life and car but keep your kids happy and occupied, we recommend the Fancy Mobility Organizer as our top choice. Need to keep the children occupied on your latest road trip? 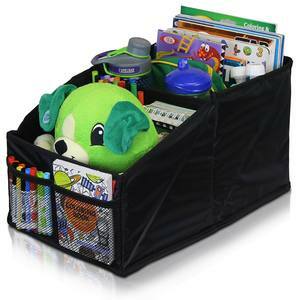 A kids car seat organizer is an easy solution to keep your car organized and your kids happy. See which products made the top five.